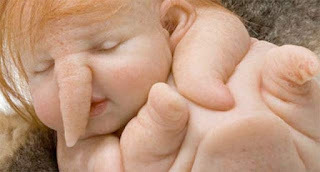 Wow...A Norwegian Baby Was Born With The Face Of An Elephant - It was a true shock seeing the baby for the first time after being born, at first the parents Lola and Alexandar Andersen planned to keep their mutant a secret from the world. However, it is very hard to keep its identity hidden, especially if a baby has a similar face as that to an elephant. Until the day of today the baby is known as John Doe, as the parents did not name the child. Reporters recall Alexandar saying that they never gave it a name and were actually considering naming their child "Creature That We Keep In The Basement". Is that even a legit name? In conclusion of the interview the parents disrespectfully revealed their true intentions with their mutant baby, as they initially wanted to hide him in the basement. However, since he became so popular amongst the Hindus, they are considering selling him to India where he can spend his life in the Taj Mahal.